It’s been twice in a week that I’ve talked with Marketing and Communication people about using Twitter for their companies and the answer has always been NO. It really strikes me, specially because both companies are part of the Tech Industry, one of them is even a well known startup. The response I always get about Twitter is: “We don’t use it because it’s only for early adopters and geeks“. While this has been the case until very recently, Twitter is gaining critical mass at an amazing pace. 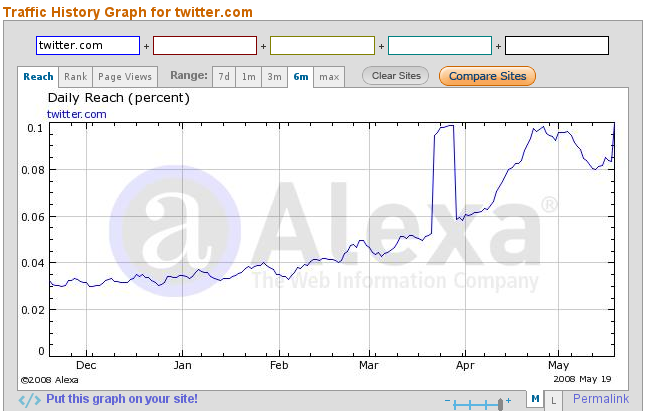 Just to throw some numbers, Twitter has a daily reach of approximately 0.1% according to Alexa. That means that 0.1% of the Internet users access Twitter each day. But, that’s not the only thing, according to Biz Stone the Twitter API gets 10x that traffic, bumping Twitter’s daily reach to a very nice 1.1%. Right now it has broken the early adopter barrier and you can start seeing a more general use of it by online users. That’s the reason I think it’s the best moment to start using Twitter as a Marketing tool. Who should use Twitter as a Marketing tool? Not everybody of course. Twitter users have a tech profile, although this profile is being widened by other online non-tech users day by day. This is something that many old school marketers don’t grasp. Everyday the digital breach between the online and offline worlds is diminishing. Currently you can see baby boomers buying food, books or flights through the Internet. You can see them chating, emailing, commenting on forums or writing blogs. Some of them are real social network junkies. Marketers have to understand that the profile of an Internet user is becoming much more general than it used to be. So, again, who should use Twitter as a Marketing tool? I would say that it should be used by anyone with a company that is related to the tech industry. That would be websites, blogs, newspapers, software vendors, hardware vendors, musicians, … hell, everyone that can make business through the Internet. Right now that is mostly everyone! Why are people going to adopt Twitter? It’s very easy, Twitter is Free and Simple. The sophistication level needed to use Twitter is close to 0 for any single Internet user. It’s ease of use is one of its strongest points. Also, the need to be connected and to know what is happening in other people’s lives is something inherent to humans. Humans are curious by nature, Twitter lets you be curious about other people at a never seen scale. The best proof of this are social networks like Facebook. What’s the real value of a social network? Simple, stay connected with your friends, or in plain English, know what your friends are doing. In that sense Twitter is much simpler and faster than any social network out there. In my humble opinion, it’s just a matter of time before all the social network late adopters take over Twitter. Finally, why do I say it’s now the best moment to start using Twitter? Well, Twitter, as what happens with blogs lets you build a big audience. And the key concept here is “build”. You can’t start using Twitter and expect a relevant audience of 10.000 users following your account. Why do I say relevant? There are many Twitter users which think that if they follow many people they’ll get followed in exchange and while it’s true that this happens (byproduct of our society, people feel bad if they are being followed but they don’t follow you back), these type of users aren’t really listening. That’s why, even though you can do that, you won’t build a relevant user base. Your messages won’t be read by the users you want. The funny part of this is that the people that follow thousands of users just to get more followers, are usually so called “Marketing experts“. That’s pretty ironic if you ask me, as they should know better. So trust me when I say that building a reliable audience on Twitter takes time and good, thoughtful messages. That’s why it’s important to start now, so that when Twitter goes mainstream your company has already a good number of followers. As they say, the more number of follower you have, the faster you’ll get new ones. UPDATE: I found a very good hands on example of using Twitter as a Marketing tool.